Now that a project has been created and a repository location has been specified, the project can be made available to other team members. In one of the navigation views select the project JanesTeamProject. 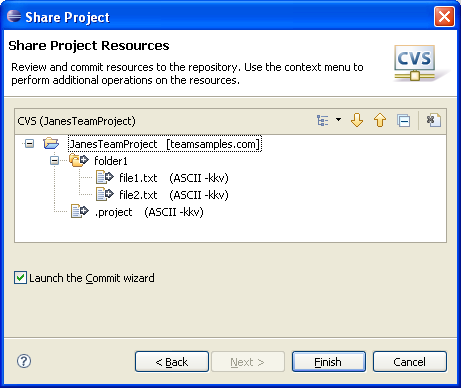 From the project's context menu choose Team > Share Project. 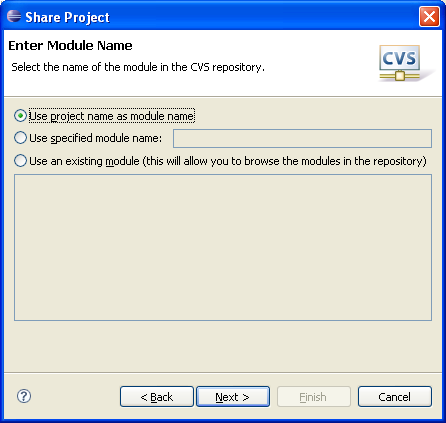 If more than one repository provider is installed, select CVS and select Next. In the sharing wizard page, select the location that was previously created. The next page will ask you the module name to create on the server. Simply use the default value and use the name of the project you are sharing. Click Next. The next page will allow you to see the files that are going to be shared with your team. The arrows with the plus sign show that the files are new outgoing additions. They have never existed on the server yet. Press Finish and you will be prompted to commit the files. Enter a commit comment to describe the commit you are making. You can enter anything you like. Press Finish when you are done and the files will be committed. 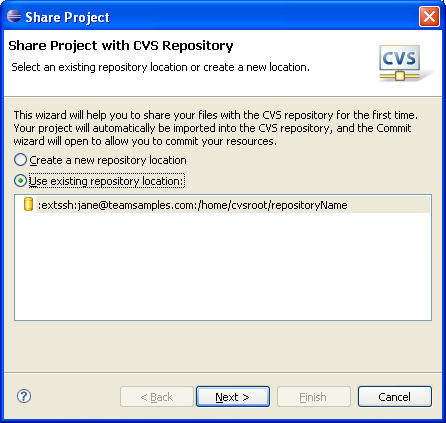 Now you have shared the project and all the files have been committed to the CVS repository. Others can now see your files!